Bad posture is an issue that many of us unfortunately suffer from; terrible posture can come from improper sitting, standing, and even walking. 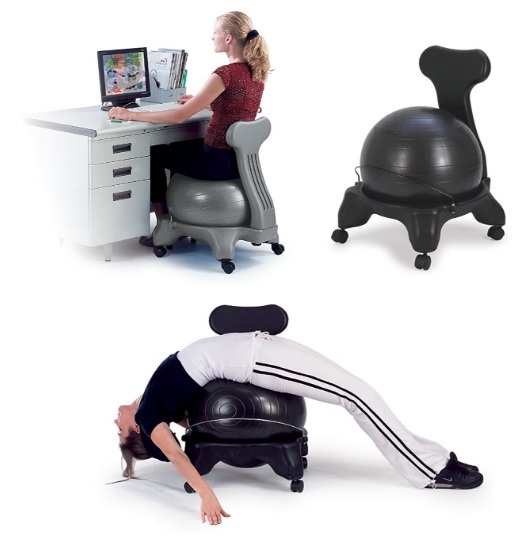 Fortunately, there are simple remedies for bad posture, one of them being yoga ball chairs; stability yoga ball chairs are specifically made to offer you a better level of comfort and support for your entire body while being incredibly easy to use and most of them are pretty affordable. 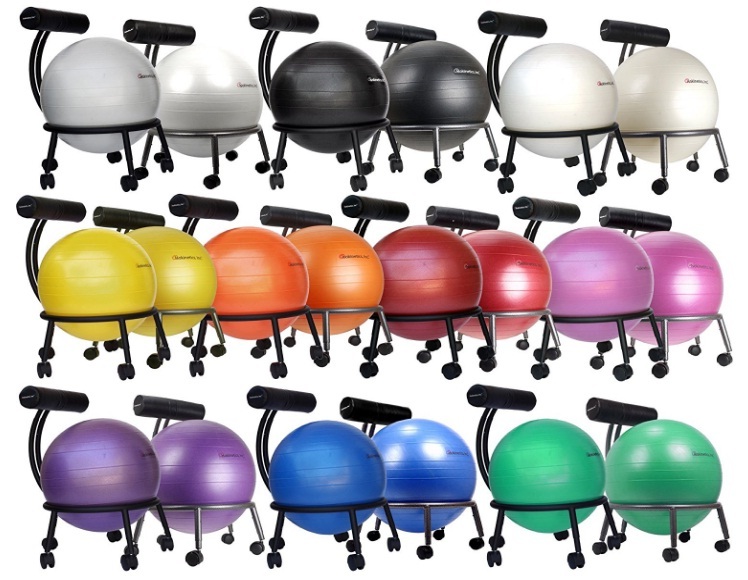 Even so, all yoga balls are not made the same and some of them are of better quality than others so with that being said we are going to review the best balance yoga balls chairs of 2018 and hopefully help you in your journey of finding the best exercise ball chair for not only your body but also your budget. 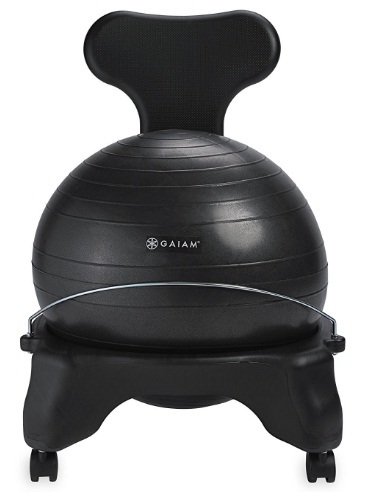 The Gaiam yoga fitness ball chair is an ideal choice for your home, office, or both; it will only cost you about $80.00 on Amazon. The Gaiam is a custom-fit substitute for your office ball chair at work or at home; this particular chair is designed to engage your entire core all throughout the day and it is also easily adjustable to fit your height and size. The primary goal of the Gaiam is to help to build a healthier core, align the spine, relieve back pain and stiffness, boost energy levels and increase productivity, resulting in a more focused and relaxed mind. This chair is best designed for people who are 5′ to 5’11” tall, has a 300 pound weight limit and fits most standard-height desks. There are also adjustable legs that allow you to set the yoga ball to your exact needs with little trouble. Additional accessories that with the Gaiam include air pump, metal base, five adjustable legs, five easy-glide lockable wheels, back rest, desktop stretching and strengthening guide, and DVD with three 20-minute workouts, as well as three ten-minute “express routines”. This is an ideal chair to help get your joints fluid and flexible; in a regular chair you can easily get stiff but with the Gaiam that will be a problem of the past! The assembly is fair easy but you may have to use a bit of elbow grease to take care of the bottom part of the chair. You may also have to re-inflate the first couple of times to try and get it to the desired size for you. The Sivan Health and Fitness ball is a little over $70.00 on Amazon and can be used in your home or at the office in order to ease your body into a more ergonomic position for greater comfort. The rolling base of the Sivan features four rolling wheels, two of which are lockable; the Sivan can also be used to stretch, correct posture, reduce stiffness and improve circulation. You can also use if you have to go through physical rehabilitation for whatever reason can reduce the chances spine disorders. The Sivan is very easy to assemble within minutes and is incredibly comfortable, no matter where you decide to set it up at. The chair is very comfortable but unfortunately it seems like the wheels can break easily; it also is a bit too low for some individuals so even though your back pain may be gone you could experience new knee pain. 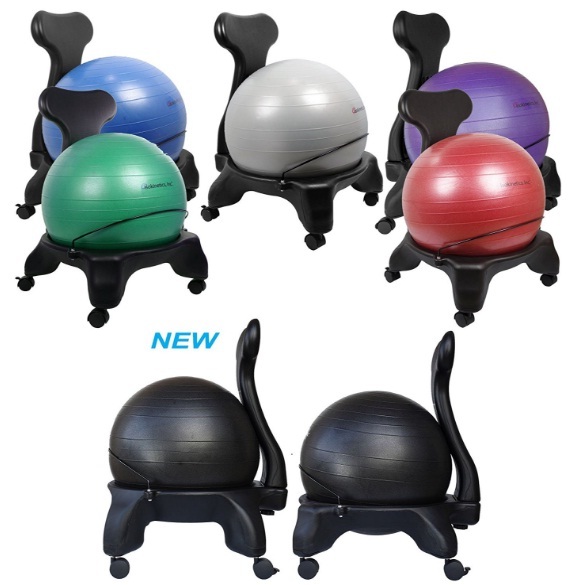 The Isokinetics yoga ball chair comes in a variety of colors and is in the $70.00 range on Amazon as well; the wheels on the Isokinetics are significantly bigger and wider than those of other brands in order to provide a smoother and easier rolling experience. You can choose between two frame finishes (either silver flakes on black or solid black). The rolling base has five wheels for stability and the Isokinetics is adjustable in two ways-there is also an adjustable back rest that can be adjusted up to four different settings to allow for the back rest to also act as a lumbar support, thus encouraging you to sit straight and proper. This particular chair is very sturdy and has a weight limit of up to 250 pounds; it is very easy to set up and the various color choices will make it a perfect fit for any décor! The overall comfort of the Isokinetics ball is amazing; however, the legs are fairly long so it may not necessarily work out if you happen to be short of stature. 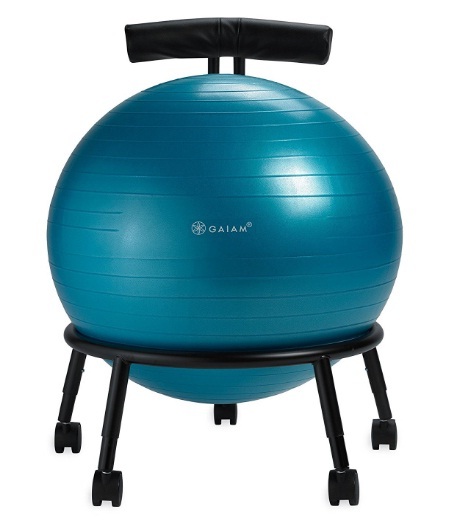 This is another yoga ball chair that is of the Gaiam brand, the primary difference being that this chair has a greater level of stability with the legs and backrest and only costing $60.00 on Amazon; like it’s fellow counterpart, the primary goal of the Gaiam is to help to build a healthier core, align the spine, relieve back pain and stiffness, boost energy levels and increase productivity, resulting in a more focused and relaxed mind. Just like with the other Gaiam yoga chair, this one also comes with the DVDs that essentially trains you on multiple exercises in order to get the best use out of the chair as possible. This is perfect for toning your core and even improving digestive tract issues; it is also very affordable so no need to worry about it hurting your wallet too bad! Unlike the other Gaiam, there is a metal bar that comes with this particular chair that can break fairly easily unfortunately, even if you are small of stature. The wiring that comes with this chair can also scuff up the ball but that can be easily remedied if you buy a cover. As with the other Isokinetics chair, it is extremely comfortable and incredibly functional no matter where you decide to have the chair at, whether it is at work or home. As said, it is made for those of a taller stature but if you are over 5’10 I would recommend buying extensions for added height. Do all yoga ball chairs come with the 300 pound weight limit? If the pump breaks will I have to buy a whole new ball or can a pump be bought separately? The answer to this may depend on what exact chair the pump goes with but typically you should be able to just buy another pump without buying a whole new ball. Just be sure to double check before buying. Overall, I would say to go with option #1- other than the slight elbow grease it may take to put the base together, it is a solid choice and very easy on your bank account. Your back and joints will thank you!